Newly promoted side Meghalaya Police football team continued their fine form in the Gionee Shillong Premier League, beating Malki by a margin of 5 goals to 1 as Malki’s goalkeeper was sent off in the first half. .
Striker Donbok Khymdiat gave the Police outfits the lead in the 3rd minute while Samson Nongrum doubled the score just past the half hour mark. Not long after this Ebor Nongtdu, Malki’s keeper saw red for handling the ball outside his box. Bantei Shylla pulled back a goal for Malki in the second half but a late hat trick from the Police outfit’s skipper Niwan-o-Gatphoh gave Meghalaya Police the comprehensive victory. Meghalaya Police players celebrate after scoring a goal. 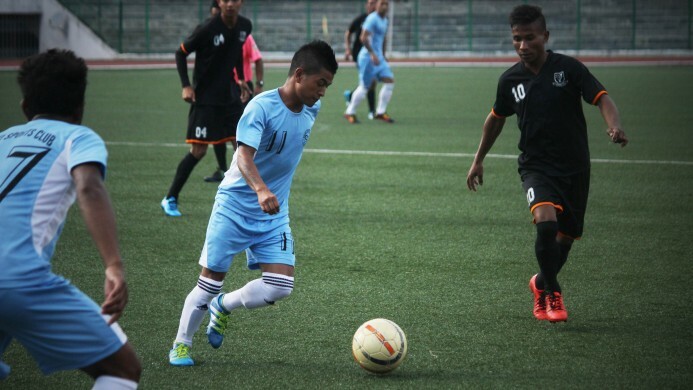 Meghalaya Police at the back of their 7-0 victory against Nongkrem Sports Club in their last outing started the match with sky high confidence. 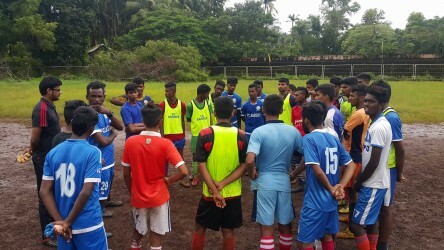 Their twelfth man; fellow policemen, set the tempo of the game with their loud drums and patriotic chants and it didn’t take long for their songs to have an impact on the match as Meghalaya Police got the lead just three minutes into the game. It was an ordinary ball into the box and striker Donbok didn’t get the contact he would have wanted as he headed the ball downwards but it proved to be enough. The ball looked as if it had drifted away for a goal kick but to the surprise of the Malki goalkeeper, the ball hit the left goalpost, flew slowly over him as tried to collect it, bounced off the turf once before taking the slightest of touch against the right goalpost and rolling into the net. Maybe it was the drums and the songs of the policemen that lured the ball into the net and before Malki could settle their nerves, they were behind. The Police outfits nearly got their second in the 27th minute but Teiborlang Siangshai’s curling free kick was palmed away by the Malki goalkeeper. After brilliantly defending successive waves of attack by the police outfits, Malki were able to counter attack and Jessamy Tariang could have got the equalising goal for Malki in the 31st minute but he couldn’t hold his nerve and his shot from a tight angle came to nothing but a goal kick. Just 65 seconds later, the Police outfit’s skipper Niwan pulled back an excellent pass for Samson in the Malki box who made no mistake and converted from close range. The skipper himself would have got his first goal had Malki’s goalkeeper, Ebor not handled his goal bound shot outside the Malki box which ultimately led to his dismissal. Stand in goalkeeper, Aibormiki Suchiang’s blushes were saved by the crossbar when Niwan’s shot from the resulting free kick rattled off the woodwork. Batshem Tariang missed another golden opportunity for Malki as he skewed his shot well wide in the 43rd minute. The score was 2-0 for the Police outfits at half time as Malki went in with a man down. Malki came back into the second half with much more tenacity and the 10 players on the pitch gave their 110% as they rallied a goal back in the 48th minute. Banshan Nongdhar, lively and quick footed sent in an excellent cross into the box that Bantei Shylla converted without any difficulty. The game was back on and for a moment it looked as if Malki would stage a comeback as they started to have more possession and created chances. Bantei Shylla came up with a brilliant solo show in the 70th minute, dribbling past two defenders and then three before finally shooting but he couldn’t find the finish and his ball went well over the crossbar. Malki kept on pressing but the police outfits were one man too much for them to take and the continued pressing of the Malki players proved fatal as fatigue took over and the Police outfits capitalised ruthlessly. Niwan, skipper of the police outfit, who had had a hand in both the goals they scored, got his deserved first goal of the game in the 81st minute when Teiborlang Siangshai’s ball from the halfway line released him down the left flank and he converted from a very tight angle showing Malki just what they had lacked all afternoon; composure and sharpness in front of goal. His next goal came in the 89th minute and the hat trick in injury time (90+1) as a result of unselfish play by Donbok. The police outfits ran out the comfortable winners and this newly promoted team currently sits top of the table with 6 points from two matches and an impressive goal difference of 11, scoring 12 and conceding just one. Meghalaya Police players celebrates with their fans. Could they possibly pull off what Leicester did in the English Premier League last season? It’s still very early in the season to pass this kind of judgement but the police outfits have definitely earned their right to dream.